We went up the canyon this weekend to enjoy the foliage (I love that word!) Fall is finally here and could not be more beautiful!!! Love the teacups and I love your hair curled! So pretty. The fall picture is wonderful. Your outfit is perfect for a foliage viewing trip! Wow, I love the foliage photo! I'm obsessed with autumn leaves! Are you going to Disney?! If you come to Florida for Disney World, I want to meet you! You look fantastic in that dress, it is so super cute and I love your ringlets! Beautiful! I almost wore my sugar & cream dress to church yesterday too! Such a beautiful family picture!! Again, love the curly hair on you! Such a fun outfit. First off, I love the family photo! Everyone looks great and all of your outfits just go together perfectly! And second, I really love the teacups dress on you. I have never really like it until now. And lastly, your hair looks so pretty curled. LOVE everything! 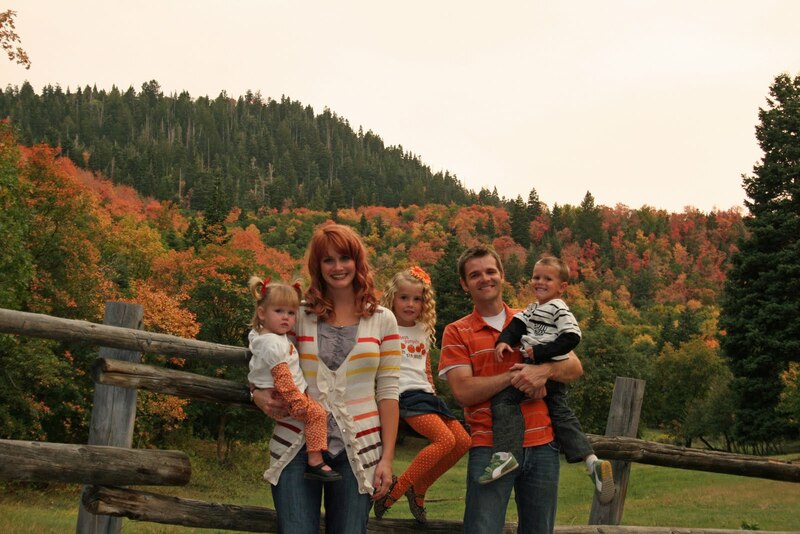 That family shot is PERFECTION - you are wearing just the right sweater to coordinate with those changing leaves too! Your kiddos are great little cooperators for pictures - consider me jealous! And now I'm going to beg my dh to decide if we are going to Disney in January or not, because if we are - hello, I need to reconsider that dress! You are super cute in the teacups, and your hair looks gorgeous! I love fun prints! Gorgeous, as always. :) I just told your sister that the two of you are the most inspirational mommies, ever! What a fun dress. I love the varied colors of the teacups. I'm hoping to find an inexpensive whimsical print dress this fall. man, i really wanted that dress when it was on sale. but NO i told myself i should save my money because i have to many dresses..and now i want it...lol. you look beautiful as always..! Cute, cute. Lovin the necklace too. oh my gosh, your leaves are totally turning color!!! I can't wait for ours to get that beautiful. WE like to go up to Holy Hill and look down at the tree tops from the church at the top. It's beautiful and serene. That dress is to cute for words!!! I love it! 1) Extremely jealous here that you've got some fabulous fall foliage to enjoy. 2) Your church outfit is gorgeous! That dress just seems very Tricia somehow - and the fit is superb. The teacup dress is so cute! And so is your family! Love the fall colours in Utah! Ok, that family picture is amazing! All those colors are UTAH in the fall to perfection! Love that cardi too...so fun! I love your hair curled...it's so cute. Does it take forever to do?? You are just too cute!! You look so cute and your family photo is adorable! I wish it looked that beautiful here. Oh man how I now regret passing on this dress. You look beautiful, as usual but this dress is really quite special. That family photo is gorgeous! I love the foliage and I think it would make a great holiday/greeting card. You look amaaaaazing. I love the dress on you and the curls in your hair are stunning. And your family photo is beautiful as well!